Eliminating the “false step” has been a personal mission of many strength coaches I have heard or worked alongside of in my 15 year career. I used to wonder quietly why it was such a bad thing early on in my coaching. Based on angles and observation it seemed almost reflexive for most athletes. Then a few years ago I had the privilege of seeing Lee Taft present his theory on speed development and multi-directional speed training and it all came together for me. Lee eloquently explained that the “false step” is really just a plyo step – a chance to load the body up for what it was meant to do. It essentially allows the athlete to reposition the body (or center of mass) more efficiently to load and explode. 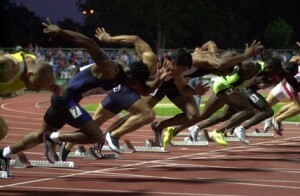 Ever wonder why sprinters use a starting block? Look at all like an athlete’s body position once they step back and begin to move forward? This topic has been covered in previous point/counterpoint articles in the NSCA journals and debated on forums, blogs and seminars alike. For me, I have been encouraging the “false step” or “plyo step” the past few years because it is ‘normal’ for athletes to move that way. As a matter of fact, one of the first things I do is put them in an athletic parallel stance position and ask them to accelerate for 10 yards. Not once have I seen them not step back provided I do not cue them to do so. Keep in mind that previous research done (Kraan, GA, van Veen, J, Snijders, CJ, and Storm, J. Starting from standing: Why step backwards? J Biomech 34: 211–215, 2001.) indicates that stepping back is instinctive in up to 95% of subjects. Pretty telling, right? Even so, many coaches will still argue this technique slows the athletes down. In this final post, I will show two simple yet very effective reactive drills I use with one of my clients training for Saber fencing for the 2012 Olympic games. In terms of reactive agility training, you can utilize audio, visual or even kinesthetic cues. As it was difficult to video myself and the client, I chose to use audio cues for this post so you could see the drills. I also use visual cues to train her with these same reactive movements. In this drill, the focus is precise quick footwork in a linear pattern. I have also added in some left and right linear movements as the athlete does lunge or attack off center in certain instances during a match. In many cases, success in fencing is defined by inches. The ability to anticipate the opponent’s movements and react faster is crucial. We use several of these drills to work on her footwork in space. Keep in mind that the progression from simple planned agility drills to more complex reactive agility training yields optimal results. With that said, strive for repetition and mastery fo the most crucial movement patterns/skills and avoid temptation to get too creative. Use drills that train precise movements in applicable spaces for appropriate time intervals. Focusing on this mix will elevate performance and get those inches you need in sport. In the first two posts on this topic I have shown you predictive agility drills. These are great for the beginning phases of training and early pre-season conditioning. Once athletes understand how to move properly, it is time to turn your attention to reactive agility as this more appropriately mirrors sport. There are countless games and drills you can use with your athletes. I have certain “go to” drills if you will but am always looking for new ones or more importantly the best ones for each athlete or group of athletes I am working with. Today I included some video taken from a field hockey speed clinic I held last month. A primary goal was to show the team a bevy of drills they could use to improve speed, agility and quickness. Another important goal was to make the hard work seem FUN. You see I was an athlete not so long ago and I know athletes really don’t get very excited about conditioning because that usually involves running, sweat and fatigue, right? So, anytime you can introduce games and competition to get maximal effort from your players or clients, it becomes a win-win for all involved. In the video clip today, you will see a friendly game of partner tag. Is this ingenious? Absolutely not. But, I strategically placed cones in a circle and then asked about 12 players to move within the circle trying not to get caught. Group one worked for 30 seconds while group two rested and then we switched. Some may say there is a greater risk of injury by confining the athletes. I simply respond by saying the playing field has boundaries and in sport there will be collision at times as well as the very real need to maneuver tightly and quickly around people to avoid collisions and score. By the way, not one person collided in our drill. Safety or the lack thereof with tag comes down to preparation and proper instruction prior to starting. Leading up to partner tag, I always initiate more basic partner mirror drills for linear FW/BW running, shuffles and combinations in a 4 cone pattern (smaller area with only two at a time). These simpler condensed drills lay the foundation for an all out reactive game of tag. The take home message is that reactive agility must be a progressive part of your field or court training to help refine proper movement patterns, reduce injury risk and maximize athletic performance. In my final post, I will reveal an even more specific reactive agility drill with an Olympic level fencer I am training for the 2012 games. I continue in this post with another drill from our lacrosse clinic. You may notice in these drills that the athletes know exactly where they are going throughout. We start with predictive agility drills in our training with the aim of teaching them how to move correctly and repeat the drill in a controlled manner. As athletes progress, we will move to more reactive agility where they respond to cues or changes in their environment. I will reveal some of these drills in the upcoming posts. In the next post I will begin to reveal some of my favorite outdoor field drills in a team setting. In many of my recent posts, I have focused on injuries and recovery. I am going to start a new series today on improving speed and agility. You see, even though I consult with hundreds of clients every year on injuries, I also train many athletes for peak performance who are well athletes seeking to maximize performance and stay injury free. To address these issues, we use certain drills in our speed camps, clinics and athlete performance training. I thought I would spend the next few blog posts showing you some of the very drills we use to improve performance, reduce or eliminate the weaknesses mentioned above and of course dramatically reduce injury risk. Repetition is key as we want to fine tune the motor patterns and give the athletes the proper patterns to feed forward in practices and games. This can only really be accomplished through proper instruction, proper selection of drills and reinforcement of proper form with lots of repetition. In today’s video, I included a 2 cone figure 8 drill that we used in a 2 hour lacrosse clinic. It is a realtively simple drill, yet so many athletes struggle to decelerate efficiently, round the cone tightly and then move toward the next cone. Making large turns reduces speed and often decides who wins on the field. Learning to stay low and turn properly improves quickness and reduces knee injury risk. This drill is usually done for 15-30 seconds (2-3 sets) to work on conditioning but allow for enough time to get the repetitions desired. Start with the cones no more than 10 yards apart and as the skill level and form dictates, move the cones closer to increase the difficulty of the drill. Be aware that the demand is higher with a shorter distance and you should judge distance based on the athlete’s ability to do the drill properly. Stay tuned as I will share more videos of drills I use in the coming days and weeks to make you or the athletes you train more effectively.